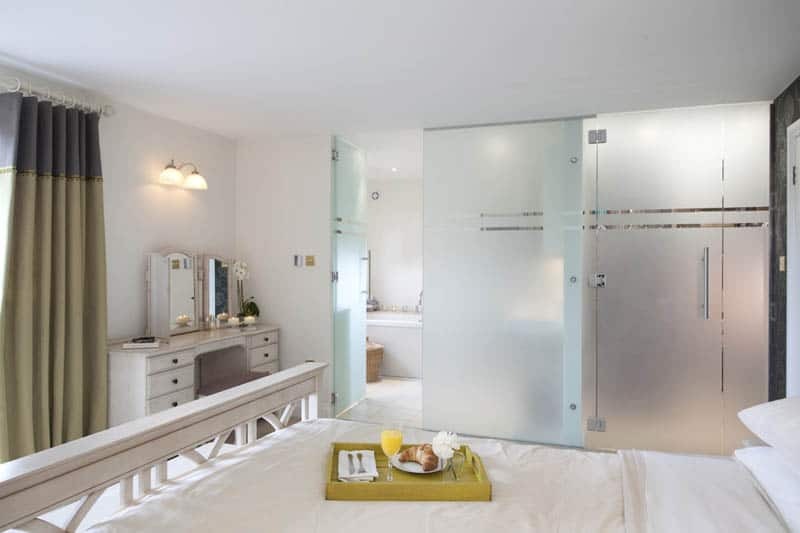 Shower doors or showers screens are those thin partition ‘walls’ that set the boundary between toilet and bathing sanctuary. Although contemporary designers want the transition to be smooth – sometimes almost invisible -, the delimitation has its benefits too. Firstly, it offers privacy. Just imagine how comfortable your prolonged bathings would be while exposed to your partner lying in bed. Secondly, it makes the environment a lot functional. 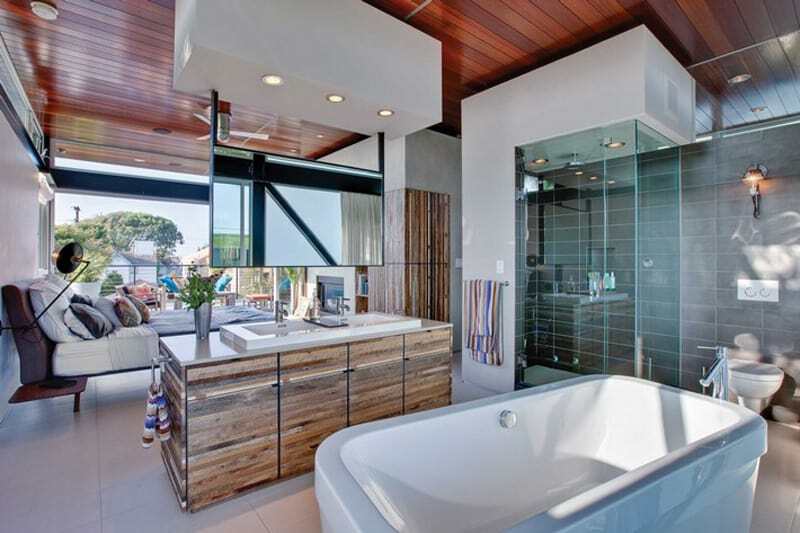 You opt for an open plan bathroom and you want to forget about doors and lockers. Great! Only that you have to take care your daily activities will continue with no stress. Splashing all over and then preparing for the best makeup in the same place is not going to work. Thirdly, it enhances luminosity. 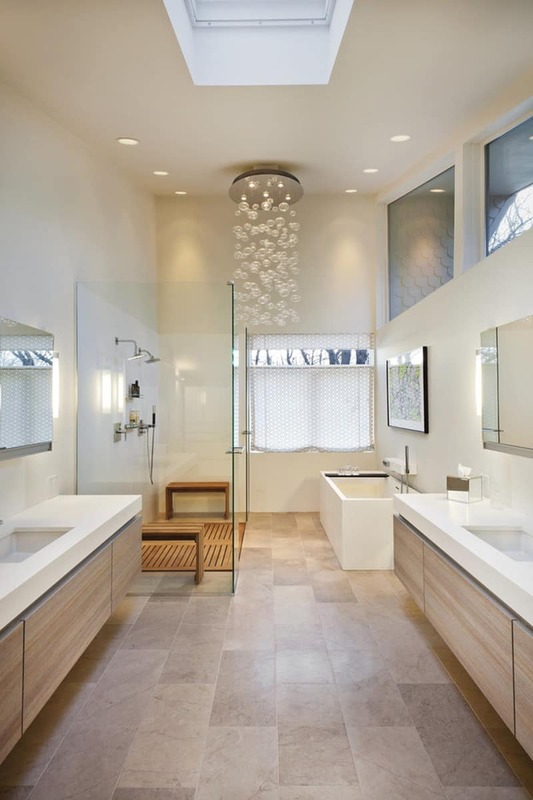 If you benefit from natural light in the bathroom, then glass showers doors or screens will make the interior even brighter. Explore our collection and pick what fits in your home! 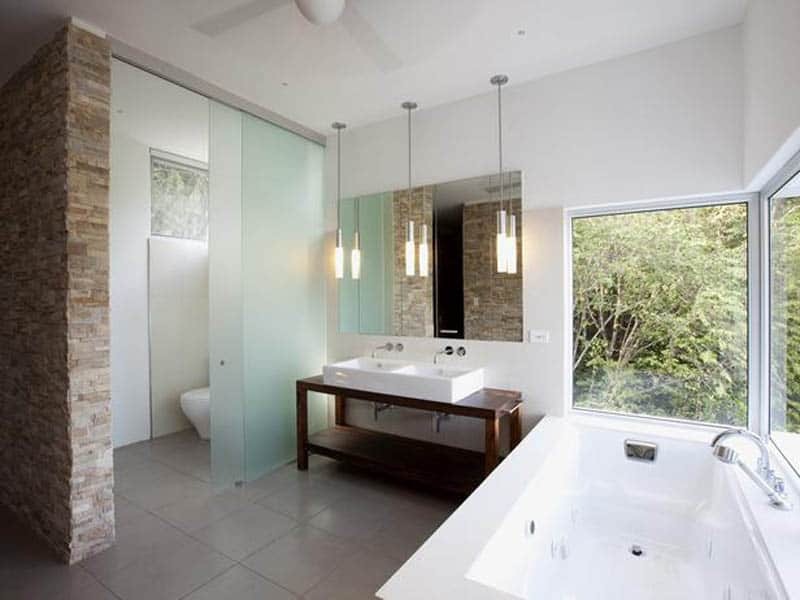 For more privacy, translucent or patterned glass is a popular option. This glass has a design that is silk-screened (painted) onto the glass before being heated during the tempering process. This permanently adheres the pattern to the glass for durability. The outsiders cannot see into the enclosure. The patterns also provide an added decorative element that helps the door blend easily with the overall design. 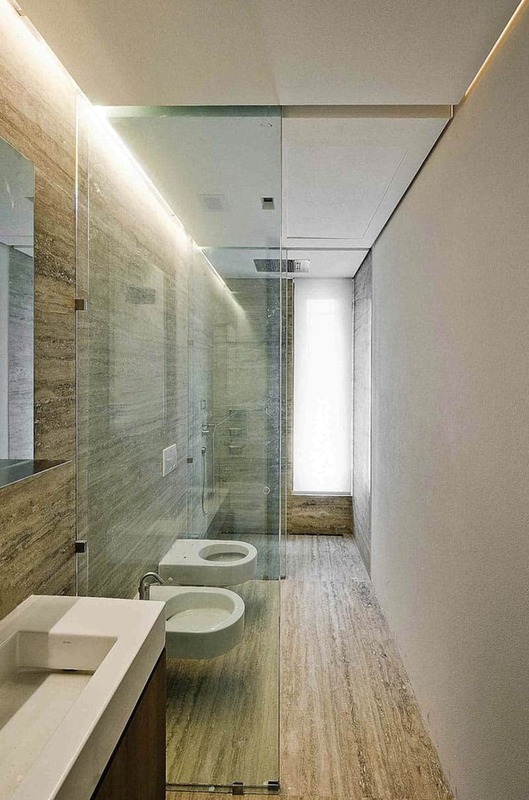 They are available in a wide variety of materials and systems: frameless, pivoting, sliding. 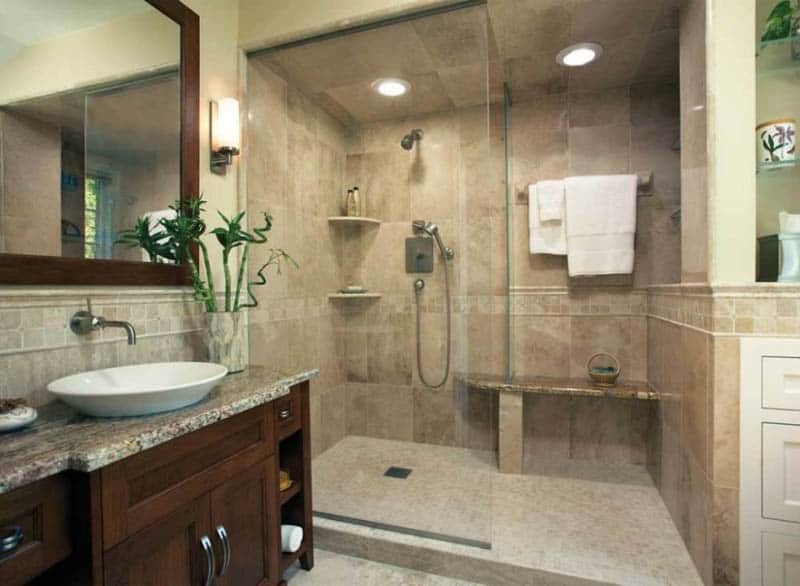 Those that slide can be fixed on the shower pan or tile apron and generally include two panels of glass. 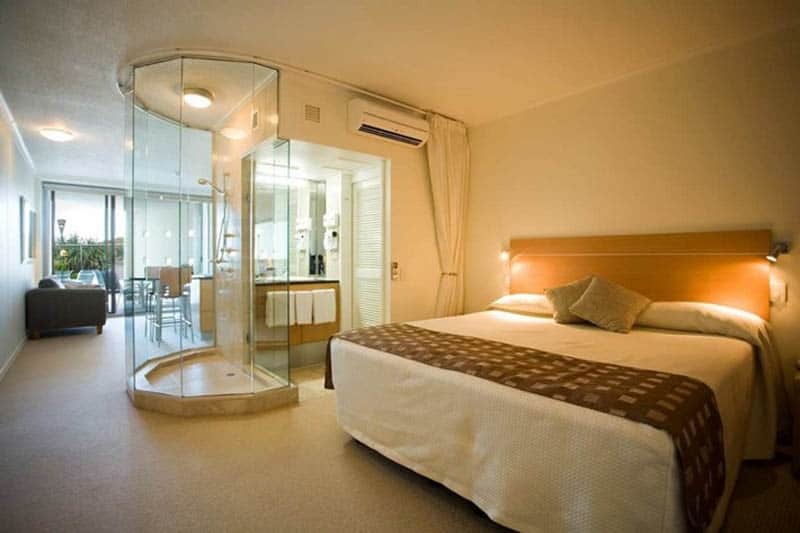 Both glide from right to left offering access to the showering area from either side. 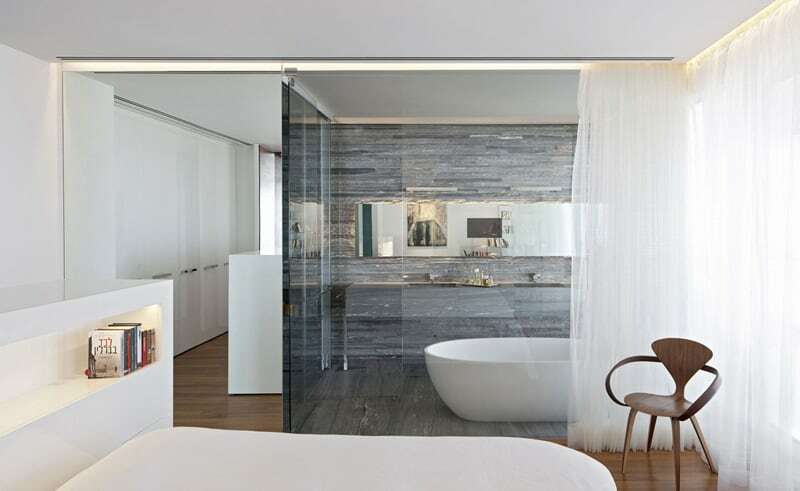 If you do not have space to install a tub or simply because you are not a big fan of it, then a walk-in shower is the solution. 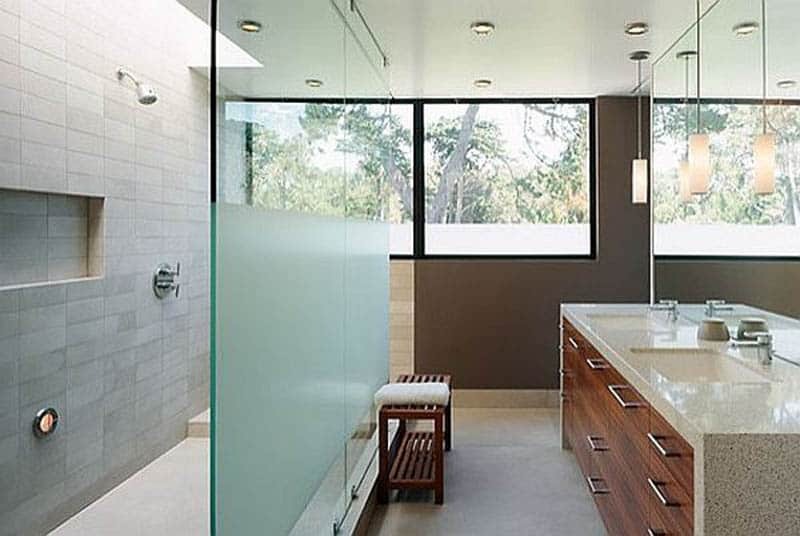 How large are walk-in showers? Normal sizes include 48-inch and 60-inch enclosures. However, customer installations can be any size depending on the space and design preferences involved. 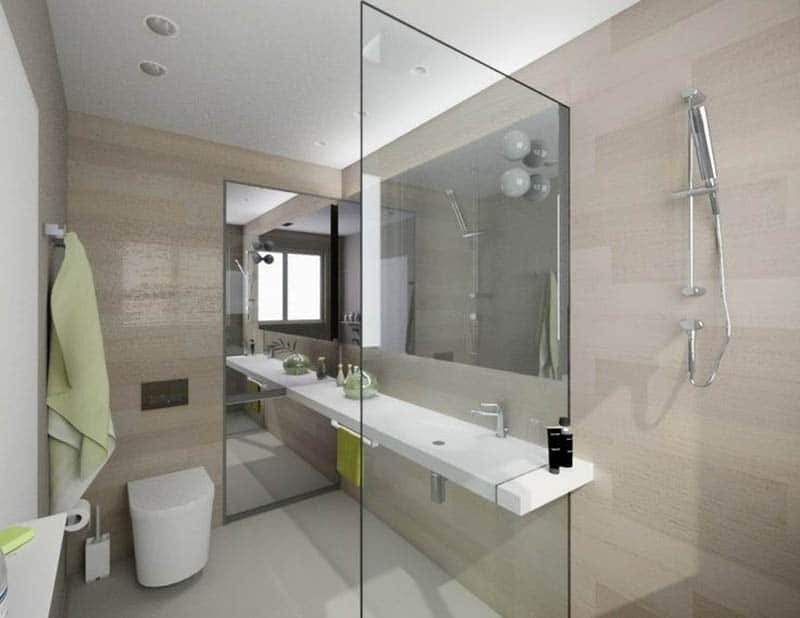 Do I need a shower enclosure? Definitely, yes. This is a watertight structure with enclosing walls, a draining floor and door or open access way. Are concerned about the models? They are available in a wide range of products. 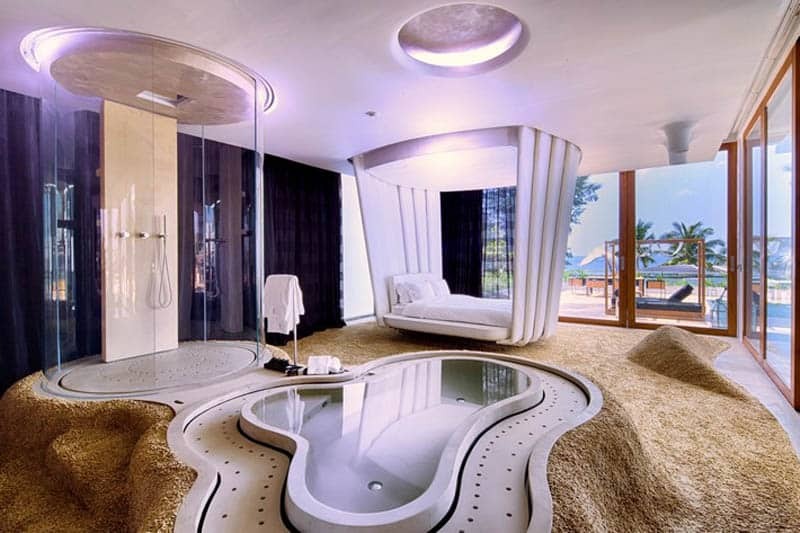 The most popular shower enclosures are tubs that feature showering capabilities. 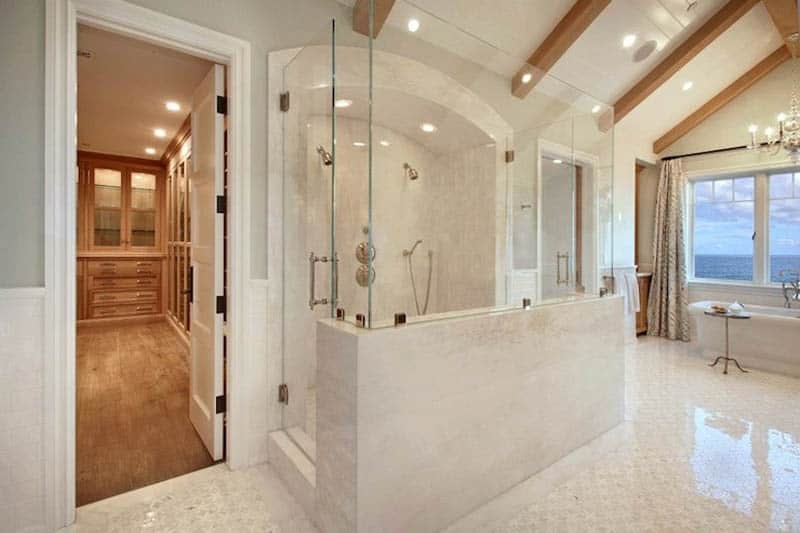 What type of shower doors should be used? 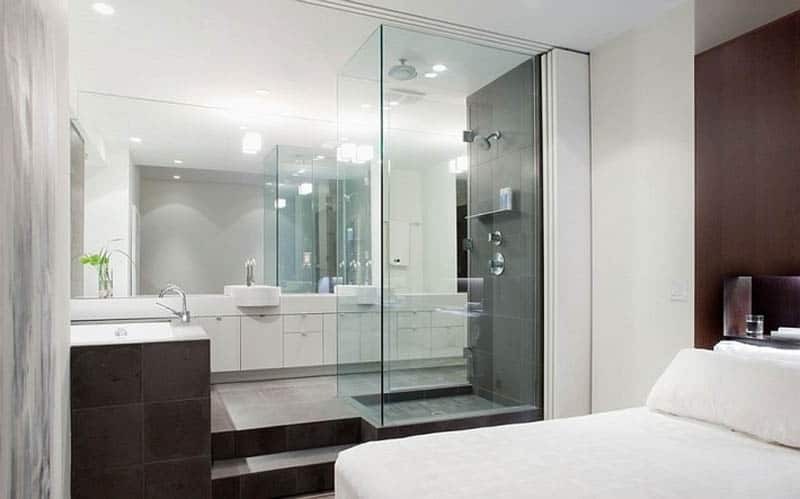 We see a lot of walk-in showers that can use either sliding glass panels or pivoting panels that function like regular doors. 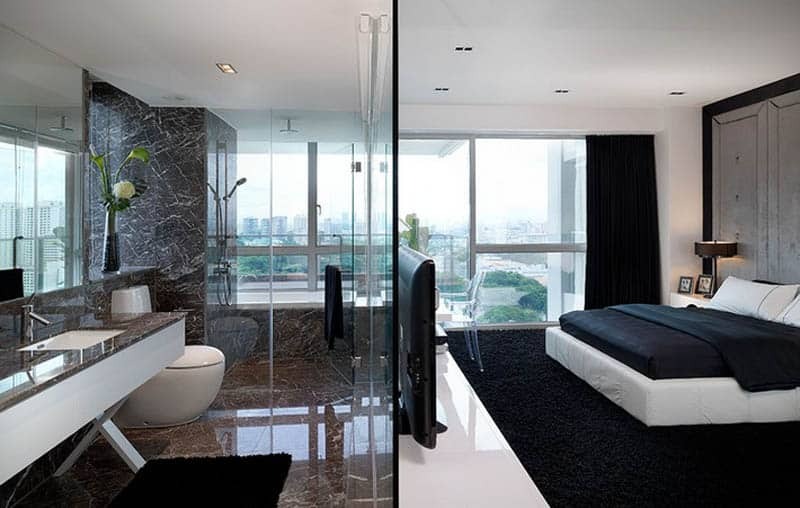 Bathroom in bedroom? Why not! A divider will help you separate the areas without causing headaches. The one above features a translucent glass screen that slides from both sides. Thus, the area is aesthetically pleasant from every perspective. Is visibility a challenge? Yes, indeed. If you want to enjoy natural light and serene landscapes then generous, maybe floor to ceiling windows, are needed. However, pay attention to neighbours. 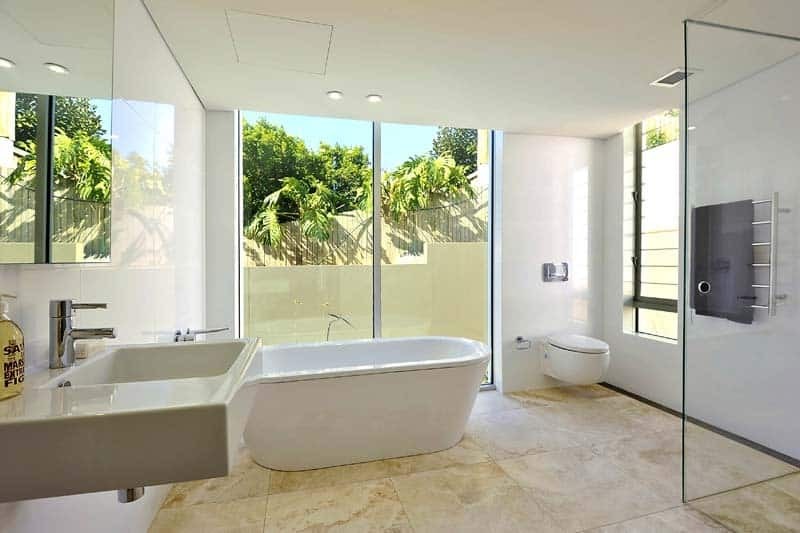 Make sure you install the tub in a place that has visibility, but also privacy. Tips? Climbing plants, large pots with tall flowers, screens etc. I love natural light and the beautiful effects it creates inside. 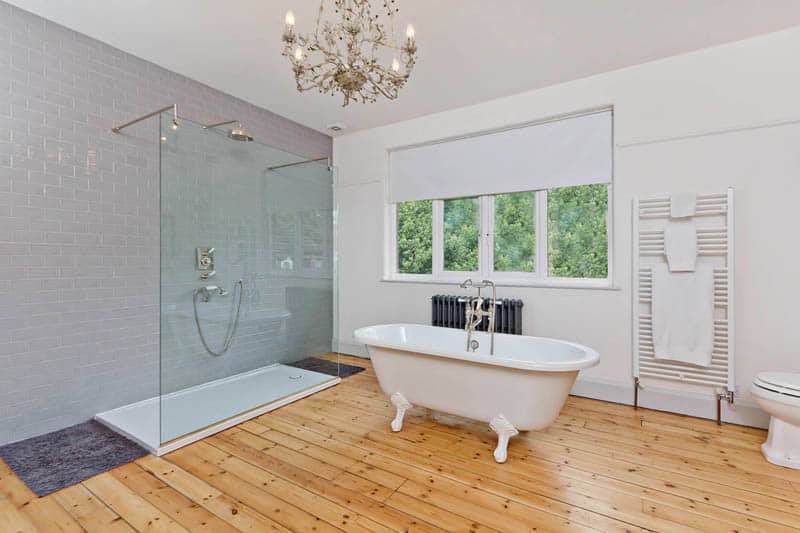 My favourite spot: wooden flooring and a vintage white tub! Paired with a silvery chandelier, the tub becomes a place for relaxation and pampering. 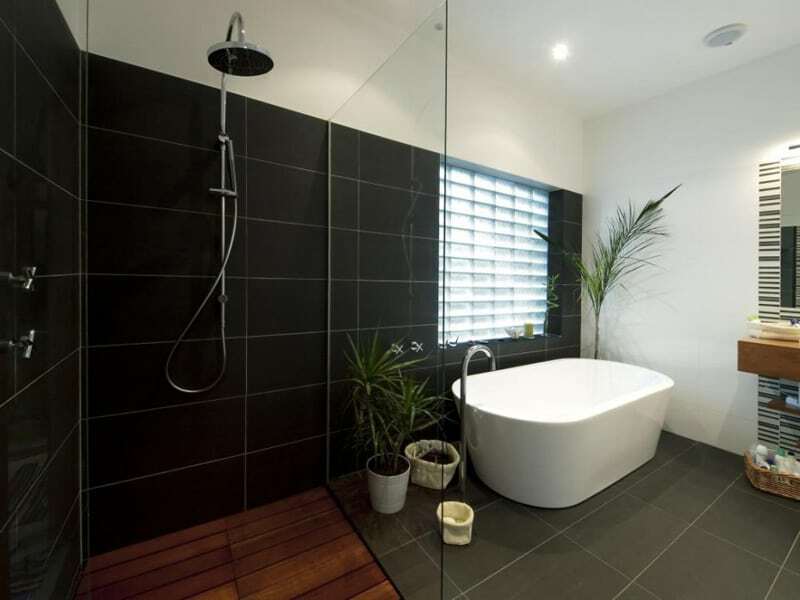 The shower installed near the wall, in an area featuring a wide transparent glass screen and white metro tiles. This is a great mix! 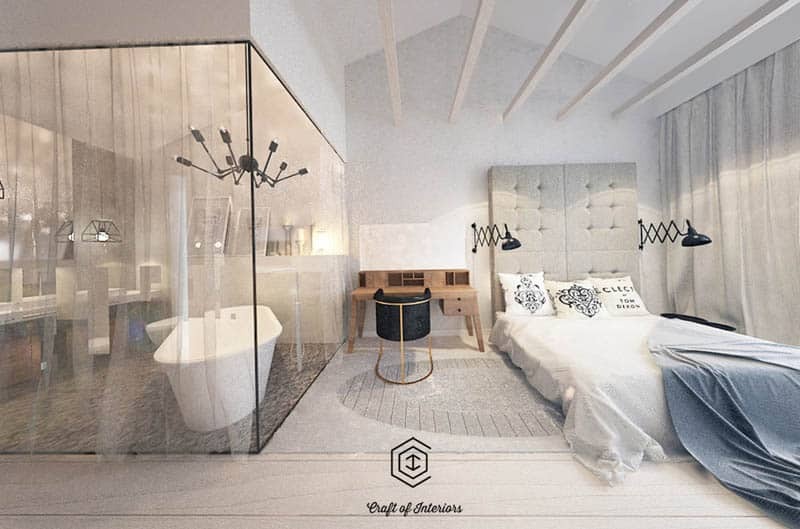 A contemporary look with vintage elements that add personality to the space.